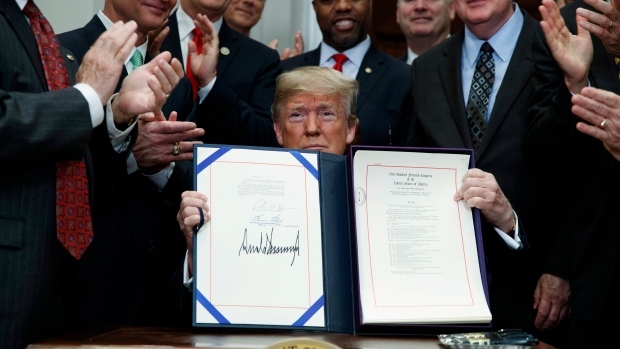 President Donald Trump has signed the biggest rollback of financial regulation since the Dodd-Frank Act was enacted in 2010, freeing smaller banks from the burden of being labeled too big to fail. Surrounded by lawmakers and financial regulators at the White House on Thursday, Trump put pen to paper on the product of years of industry lobbying and sensitive talks on Capitol Hill to gain bipartisan support needed to get it through the Senate. The law gives regional and community banks relief from rules that they’ve decried as burdensome and costly. It raises to US$250 billion from US$50 billion the asset threshold for lenders to face stricter Federal Reserve oversight as systemically important financial institutions. That would free companies such as American Express Co. and SunTrust Banks Inc. from higher compliance costs associated with being considered too big to fail. Small banks are also freed from Volcker Rule restrictions and the legislation makes a technical fix that would let some investment firms like BlackRock Inc. continue trading with some funds. Among the biggest losers are bigger regional banks such as Capital One Financial Corp. and PNC Financial Services Group Inc., which would keep their SIFI designations. Wall Street banks like Citigroup Inc. and JPMorgan Chase & Co. also lost out on getting relief from some capital requirements they lobbied to include. A small win for Wall Street comes in the form of a provision letting big banks include municipal bonds in required stockpiles of assets that could be sold to provide funding in a crisis, something that JPMorgan and Citigroup have sought for years. Custody banks such as State Street Corp. and Bank of New York Mellon Corp., which specialize in safeguarding assets as opposed to traditional commercial banking, get relief from some capital requirements.